When you bring your baby home from the hospital you hear that NOTHING should go in the crib. You are told to maybe even let your kid cry it out because they are sooo safe there. Well I have news for you, I haven’t found the crib very safe lately. For the past 5 months Isabella has been getting her legs caught in the crib during naps and the night time. It scares me because she really gets stuck. Not long ago both legs were stuck all the way up to Izzy’s thigh and I thought my husband was going to pull the crib apart with his bare hands. I could hear the crib cracking. At first you might think, it’s silly or cute. She was sound asleep and didn’t seem distressed. But it’s not cute and when I woke her up she was scared because she was stuck! She also had marks on her legs for over a week. It’s a serious problem. It took me climbing into the crib and my husband on the outside lifting and twisting her to get her legs out. We have tried the mesh bumpers, but she kicks above it and kicks it down. They are tied on so they slide down very easily. 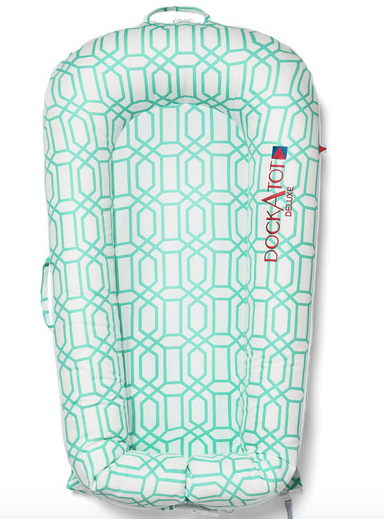 We now have a DockATot™. First I want to let you know what this is and then why it has helped us. A DockATot comes in two sizes the DockATot™ Deluxe and DockATot™ Grand. The Deluxe is recommended for ages 0-8 months. While the Grand is recommended for 9-36 months. It can be used for lounging, tummy time, changing, cuddling, playing and even resting and so much more. If you co-sleep the DockATot creates a great space for your baby to sleep near you. DockATot™ knows the importance of thinking about a baby’s microclimate. The microclimate is the space directly affecting their surroundings. DockATot™ is hypoallergenic, yahoo!!!! It is made with the most nurturing and hygienic fabrics that also have excellent air-permeability. For Toddlers DockATot™ Grand was created to help ease the transition from crib to toddler or big kid bed. It has built-in, air-permeable bumpers that act as bed rails, and give your child a snug sense of security in their newer, bigger beds. We love the Grand because it keeps Izzy snuggled and she’s no longer kicking out at the rails or sleeping up against them getting stuck. This has been such an amazing find! Could she be sleeping any more peaceful? 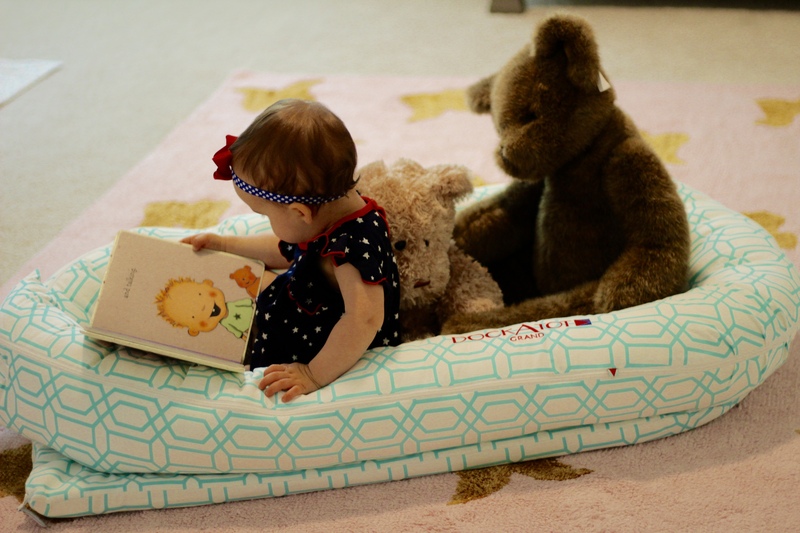 Not only does Izzy love to sleep in her DockATot™, she loves to play and lounge in it. My husband calls it her boat. I highly recommend this product for babies and up! If I knew about it when Izzy was younger I would have had this product a lot sooner. Go check out all of the fun colors and designs they offer and pick out a DockATot™ for your babe. Love this post!!! Ordering for Willy? That’s a great item, I’ve never seen anything like it. And it’s so versatile,. I’m getting one for my daughter! This looks amazing! Is it safe in the crib (like climbing wise)? My almost one year old still wakes up several times a night. She is not a huge climber, but she is always standing in her crib. Does it help her sleep through the night? 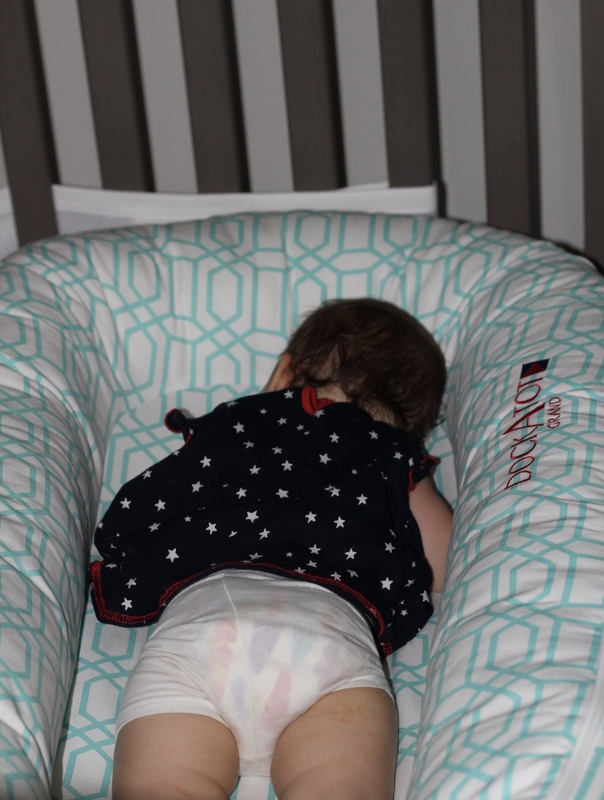 DockATot is the best toddler sleep accessory I have used! I am a Nana and have lots of sleepovers! The docatot people recommend not using it in a crib…I was devestated bc that is my plan. I see that you do and you have found it to be ok?